On USA Presidential Election Day 2008 an independent and anonymous survey has found that 59% of American voters believe that public speaking skills are back in fashion…the result of presidentially speaking candidates. In a vigorous election campaign noted for its public speeches and debates some 53% of those surveyed stated that the wave of presidentially speaking candidates and their public speaking skills had influenced them. And 59% of those surveyed noted that face to face debates, public speeches and town hall meetings had the most effect upon them. In contrast, those surveyed noted that campaign rallies, radio and TV advertising were ineffective influencers. Many of those surveyed noted that face to face debates and speeches ensured the candidates themselves explained their positions on the record. But their enthusiasm for these events was marred by concerns with the over-preparation of debates. In a campaign in which the viability of candidates’ speech writing and public speaking has been to the fore, 47% of the survey noted that ability would be the single most important candidate consideration in voters minds when voting. Some 18% reckoned that honesty would be the most important consideration. In terms of leadership skills, “hands-on” and “achiever” qualities were the highest priority (26%). “Communicator” and “speaker” skills were the second priority (21%). This web-based email invitation survey was carried out by Time to Market between 29th October and 3rd November 2008. All the 1,700 anonymous respondents were USA voters. 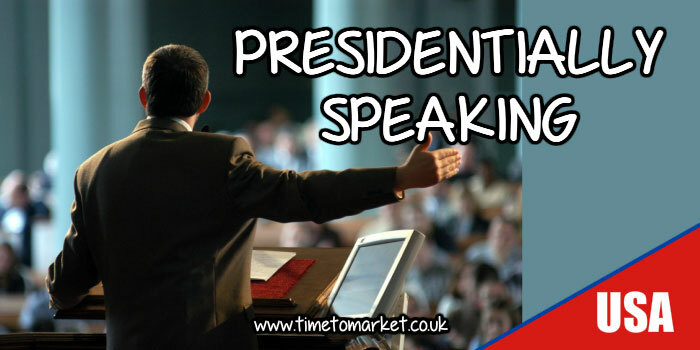 Time to Market provides first class public speaking training courses from a national network of public speaking training venues. Courses cater for the training needs of a range of public, private and third sector organisations. Public speaking skills are boosted with the innovative PresentPerfectTM training course (six trainees per class). Time to Market public speaking courses are available at each UK training centre.